Fireback artist and soda maker J. Del Conner fights Philadelphia’s regressive Beverage Tax. To mark the Bicentennial of his great, great, great grandfather Dr. Philip Syng Physick’s introduction of artificial carbonated water to America in 1807, J. Del Conner with the old family recipe founded Dr. Physick Soda Company in 2007. A very popular item in the Historic District of Philadelphia, due to a $.015 per ounce tax imposed by the city this soda is struggling to keep its retail customers. 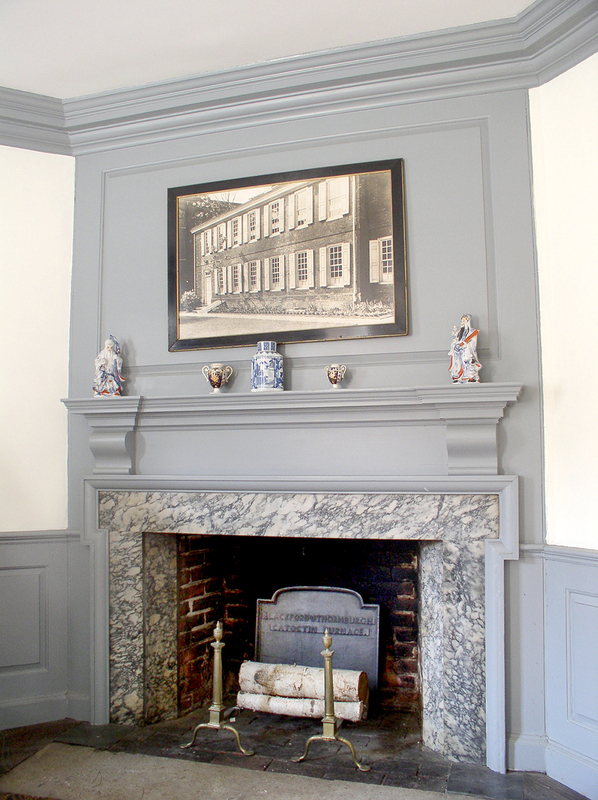 Historic Reproduction Firebacks at Powel House in Philadelphia. Visit the historic home of Philadelphia’s Patriot Mayor, Samuel Powel, ca. 1769, and you will see a number of Pennsylvania Firebacks’ Historic Reproduction Firebacks in the hearths. Saved from demolition in 1932 by the Philadelphia Society for the Preservation of Landmarks (Landmarks), this Georgian period mansion was the premier social gathering place for patriots in Philadelphia leading up to the Revolutionary War, during the Constitutional Convention, and the years when the city was the capitol of the new Federal Government. Around the corner from Powel House you can also visit Landmarks historic home of Dr. Philip Syng Physick and meet the Doctor’s great, great, great grandson, site manager, and firebacks artist, J. Del Conner. THE PATRIOT, starring film actor Mel Gibson, is a drama about a farmer during the Revolutionary War who reluctantly joins the militia as the action reaches his town. Also playing a part in this movie is the Smithsonian Institute, which for the first time is involved in a feature film as a historical consultant. Four firebacks from the Pennsylvania Firebacks collection have been chosen for use in the hearths of this epic film in the making. The Joseph Webb Stag and Pine Grove Firebacks were chosen from Pennsylvania Firebacks award winning collection of reproductions. 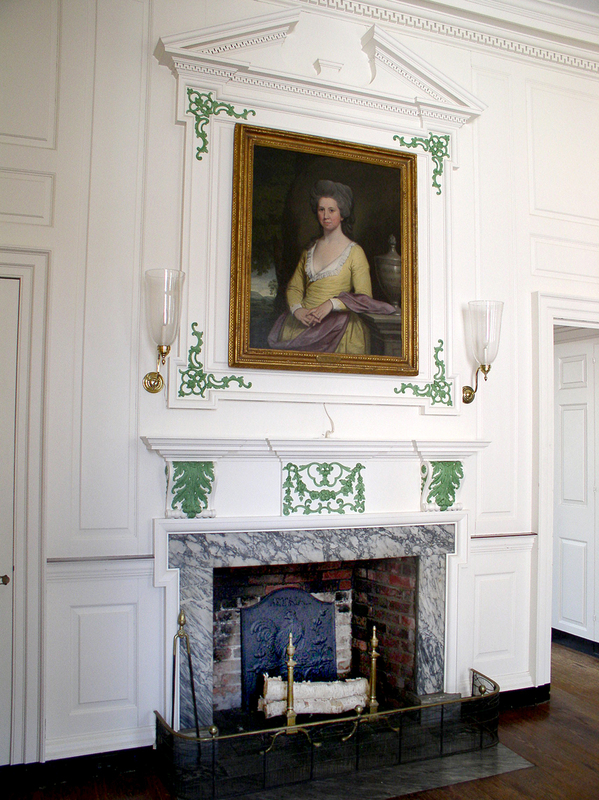 Another of the antique reproductions used in the movie is the Hereford Stove Plate, the original of which is now on display at the Historic David Rittenhouse Village in Philadelphia. The fourth “Patriot” back is the classic Plain Panel from the Signature Edition of original firebacks by artist J. Del Conner. Set in Historic Brattonville, South Carolina, there are sure to be scenes focused around the center of the colonial home, the fireplace. 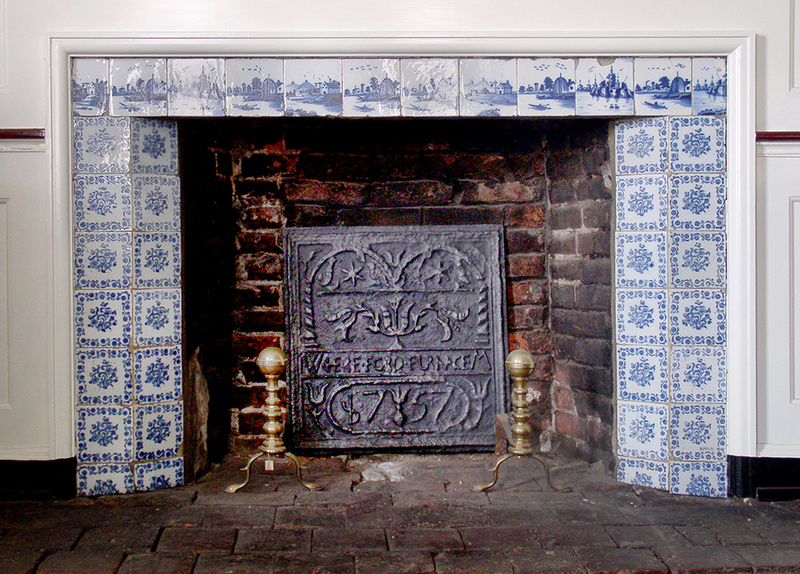 The inclusion of firebacks on this set highlights the fact that in earlier times, no fireplace was complete without a cast iron fireback in place. Choosing a fireback for your hearth is a combination of aesthetics and space considerations. A fireback should be at least wide enough to shield the hearth wall directly behind the fire. It is not uncommon for there to be 3” to 10” of exposed back wall on either side of a fireback. The top of a fireback must be below the flue opening. 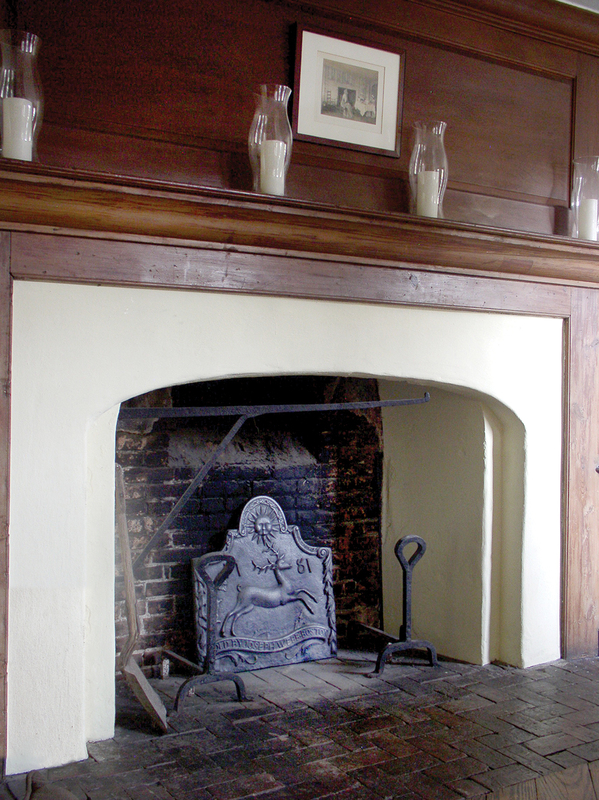 If the back wall of the fireplace is perpendicular to the hearth floor, as are many old hearths, a fireback can be simply leaned against the wall. To prevent the fireback from falling forward it is very important to place a thin non-flamable spacer between the back of the fireback and the wall to insure proper balance. To insure proper balance and to raise the fireback for better viewing our Saf-T-Boot support system can be used to hold the fireback perpendicular to the hearth floor. Many modern hearths have a back wall that leans slightly forward either from the floor or from a few brick courses above it. In this case our Saf-T-Boot support system can be used to raise the fireback and hold it leaning forward at an angle. Pennsylvania Firebacks are shipped with a water base black paint to prevent rust in transit. To give a brighter finish to the fireback and to protect the casting from rust after use with a fire, an application of water base graphite Stove Polish or Stove Black is recommended. Applied with a toothbrush or rag, this paste when dry can be polished with a wire brush or rag giving the fireback an attractive silverfish sheen. This graphite finish is durable and can be re-polished in place after many uses without reapplying the polish. In 1982 Pennsylvania Firebacks, Inc. sent President Ronald Reagan one of our first castings of the American Eagle fireback. This fireback had been produced to mark the two-hundredth anniversary of the American Bald Eagle as the central figure on the Great Seal of the United States. In this time of national trial, I hope you will now accept this gift of a We the People fireback. 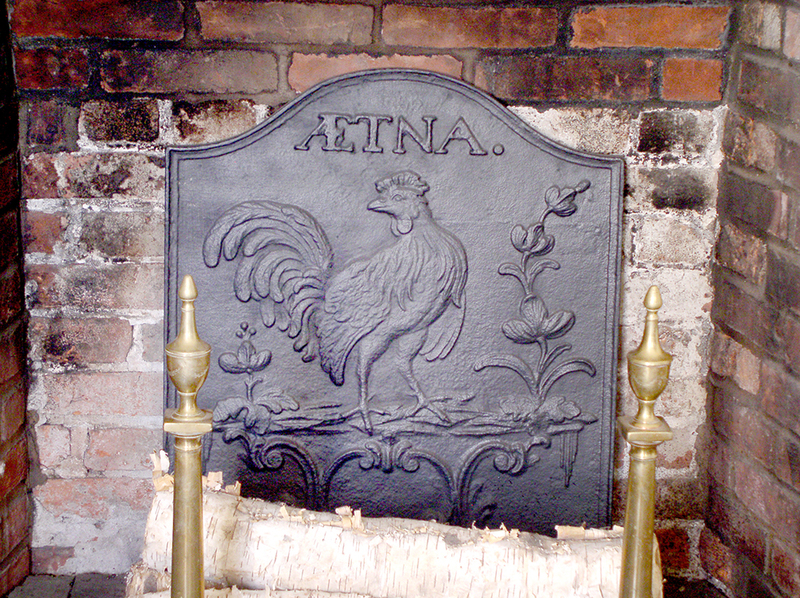 On this cast iron fireback is the preamble to the United States Constitution, framed by the inkstand and Rising Sun chair from Independence Hall. 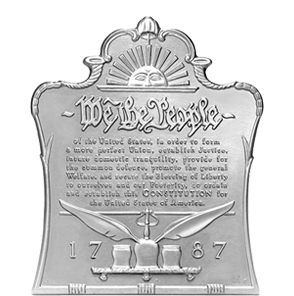 This fireback was first produced in 1987 for the We the People 200 celebration, and has recently been reintroduced to our line. Since 1979 we have had the pleasure of revitalizing this all-but-forgotten art form. Being an artist and a descendent of Philip Syng (1703–1789), the silversmith who crafted the inkstand used to sign the Declaration of Independence and the United States Constitution, I feel a particular pride in his work’s connection to these historic documents, and to include it on this fireback. As “we the people” are protected and comforted by our Constitution, may this fireback protect your hearth wall from fire while providing warmth and comfort through winter’s long nights.